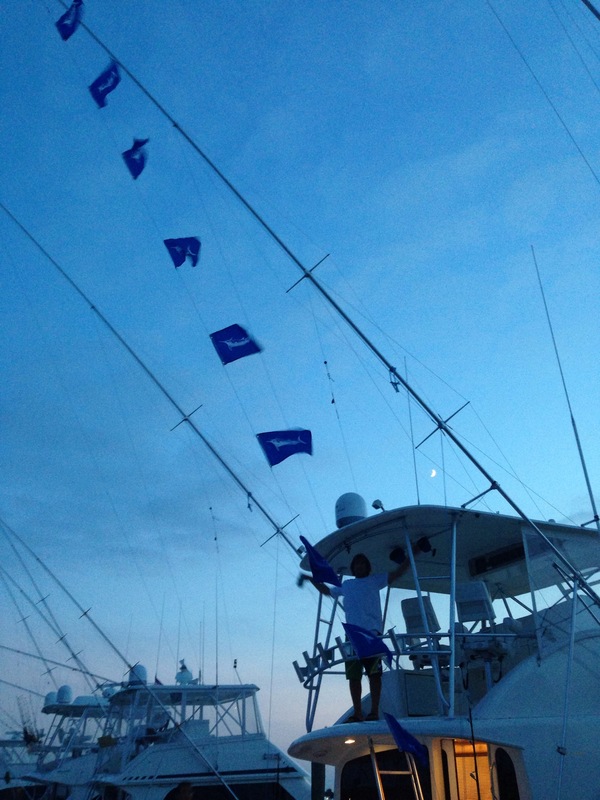 Saturday I ran the 52′ Ocean Yacht “Saltitude” for a day trip of white marlin fishing. The bite has been on, and unfortunately I could not make it to where I wanted to be on Friday, BUT this trip was a different story. I ran down towards the 100 fathom line in between the South Poorman’s Canyon and the Washington. Once we hit 50 fathoms we found a solid temperature break (75-78 degrees) and a weedline. 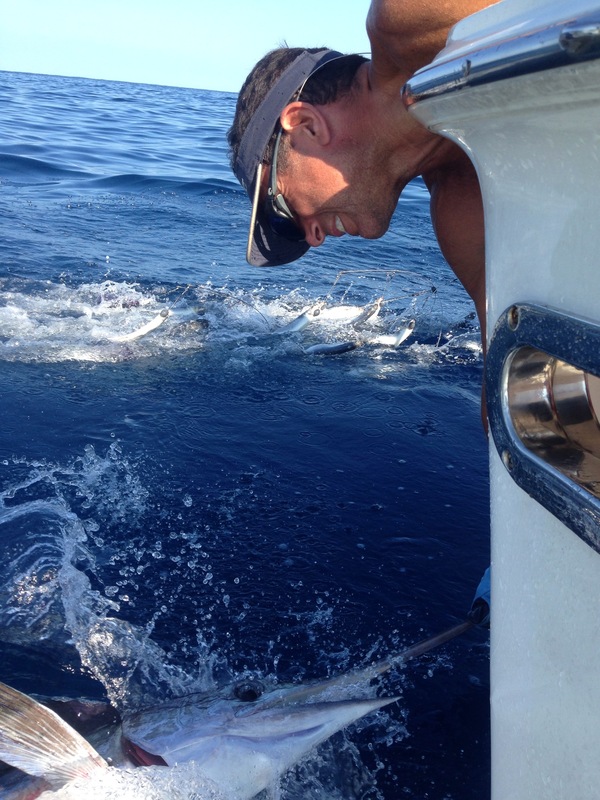 We picked one dolphin off of the weed line, but we pushed off towards the edge to find billfish. After trolling for about an hour we finally got our first white and started off 1/2. Then we picked up a single and then a triple. It was ON!!!! We had a great morning going 8/10 then mid day the bite slowed down. We had single bites here and there which unfortunately were missed, and then around 2 pm the bite turned on again. Small bonita were on the surface and I marked some small bait balls around 60-80 feet down int he water, we had a ton of bites and a lot of misfortune on hookups. We ended the day going 9/19 on white marlin. Fun day full of action!!! I ran out on the Trade In hunting for white marlin yesterday. Maureen and I always get in a “birthday white marlin trip” around her birthday every year. We had Cullen and Spencer (my two mates) with us for the trip so we were pretty amped to go get on some white marlin. We started just north of the Olinda Wreck and worked our way to the Poormans Canyon. We worked around some lobster pot markers and picked up quite a few gaffer mahi then picked up a white marlin. Mo was stoked to get her birthday white marlin for her third year straight. We saw three more whites here but they didn’t want to eat. We worked into the poormans canyon and worked through the weeds and managed to pick up some more gaffer dolphin and another white marlin. We had pretty blue water around 77 degrees all day. We had one more shot at a white but it turned out to be a miss. Man other fun day on the Trade In, my first of the season. Went fishing yesterday with a great group of guys in search of some meat. We ran to the 30 line around the Indian Arrow and found a nice weedline with some meat fish around it. We managed to out a catch together in a few short hours and headed back in. Beautiful day on the water! After yesterday’s good fishing we decided to go back out today and try the same area again. The first 40 miles out was a smooth ride minus having to change an impeller on the generator on the ride out, but I got that straightened out. Once we got closer the wind was up out of the ESE at 20 and we had 4-6 foot seas at 5 second out of the SE (head on). Oh well, we were already there and in out first 2 hours we were 2/3 and saw one more white. It was looking good, so we kept at it. We picked up a 40# class yellowfin but popped it off at the boat. After that it went silent for us the rest of the day. Well today we had pretty good billfishing going 3/6 on billfish and seeing a blue and a white that just didn’t eat. Two whites and a sailfish today, the sail was a nice surprise. Back at it again tomorrow. Well, we decided to go give the Wilmington a shot searching for bigeyes today. We got there before first light and went 0/3 on white marlin in the first hour (oh boy – here we go). We pounded out the area with about 50 other boats and the eyeballs never bit. Around 10 am we made out way back to the West wall where we hooked up a White, but due to a tangle fiasco that fish pulled off. Chalking up to be one of those days. After all of this I made the cal to go tilefish and turn things around a bit so we caught some tiles then got back on the troll. The edge of the eddy pushed into the SW corner of the canyon and was pretty blue 77 degrees but full of weed, pretty much unfishable. From there we pushed inside to 50 fathoms where we missed another white marlin and had a yellowfin bite on the rainbow spreader bar that never came tight. We works hard til 4 pm trying to get a hook into something, but nothing panned out unfortunately. The wind has come up out of the South and made the seas a choppy 3-5 for the ride home.